I chose this definition for the character trait of truthfulness because I want my whole life, and the whole life of each of my children to be characterised by truthfulness, not just our words. Many other definitions look at the rewards of truthfulness (earning trust) and though this maybe true I want to be truthful regardless of the rewards. When discussing with my children that the opposite of truthfulness is deceit it became clearer that we were talking not only about our words but our actions and our attitudes as well. This verse talks both about speaking and walking – both our words and our actions need to line up with Truthfulness. If we are to communicate what is genuine and accurate in all that we say and do, this includes our body language, our speech, our facial expressions, our actions & activities, and even our clothes. It is hard to teach our children about the impact of First Impressions but as we study Truthfulness a moral reason for how we dress and how we act and how we talk became apparent. Do our choice of clothes and accessories communicate to the people around us what is genuine and accurate about our heart? Does the way we carry ourselves, walk and talk, communicate truth about ourselves? Does our body language communicate truth? I heard a story once of a girl trying a different hairstyle and yet when her Mother expressed how other people would read her that day, the daughter had to decide if this was what she wanted to reflect, was that idea people would have about her true to her heart? We could easily say, that the people around us should see our heart – but it is the responsibility of the communicator to be understood. It is up to each one of us to communicate to those around us what is in our heart. We need to be constantly aware of the messages we are sending out, and to ensure that they are True. We are very familiar with the idea that we need to be truthful in our words, but our actions with our body need to be truthful too. The other day a friend and I were at a restaurant and we wanted a cup of tea. We went to the counter to order it and had to wait for a long time. The waitress eventually came and took our order and disappeared. My friend made a comment that it didn’t look like the lady wanted to serve us. We waited a long time for our tea and coffee. The waitress did the job but her body attitude told us she didn’t want to. We call this body language. Lets do some play acting – Lets see if your words can say one things and your body say something else. Can you greet someone at the door, and your words are welcoming but your body is not? Can you greet someone at the door, your words are not welcoming but your body is? Can you greet someone at the door, with your words and body telling the truth – not welcoming? Can you greet someone at the door, with your words and body telling the truth – welcome a friend! Have fun with this exercise – but the real applications will come when your children say yes to you when you ask them to do a chore but their body language is saying no . Use this object lesson to remind them to be truthful in their real life, everyday situations. Truthfulness builds relationship. When we are consistently true in all that we say and do, then people will begin to trust us. That trust will lead to a stronger relationship. The opposite is true as well – when we speak an untruth the relationship is damaged. We must protect, not only our hearts but also the relationships we have with other people by waking in truth every day. Truthfulness must become a habit - It is when we act without conscience thought, that when we choose Truthfulness without thinking of an alternative, that we have truthfulness in our heart. Like a madman shooting firebrands or deadly arrows is a man who deceives his neighbour and says, I was only joking! This verse tells us that it is deceit to say, I was only joking . We must look at our hearts, and teach our children to look at their hearts and be truthful. Most times when we use this phrase, we know in our hearts there was an element of truth in what we said. We may regret saying the words and cover up by saying I was only joking. This isn’t being truthful in our relationships. If you have a problem, discuss it, use tactfulness, be truthful and loving but don’t lie about it! Humour is another area where we need to be careful. It is easy to think that character issues don’t apply when we are being funny but this is just not the case. We must be truthful in all that we say and do and this includes our humour. Our humour must reflect who we are and what we believe. We have all been in that social dilemma of having made one social commitment only to receive another far more exciting invite. What to do? As always, truthfulness is the way to go. This means keeping our commitments, being true to our word. To live a life of character, to life a life of truthfulness, there is no choice other than to hold to our first commitment. This is tough at times, but it is truthfulness! The histories of Abraham, Isaac and Jacob are good to read when studying Truthfulness – all of these men lied. In the case of Jacob, he actually feared for his life though God promised him protection. Even after God promised no one would kill him, there was still a consequence for his untruthfulness - Jacob ran away; he moved to a different country where he would have missed his family. Many, many years later when he decided to come back home, he brought many presents with him for his family, he was still unsure if he would be safe. I reminded my children that even though God forgave Jacob there were consequences. It is the same for them; Mummy and Daddy will forgive them when they are untruthful but there will still be consequences. Untruthfulness breaks relationships. Our words come out of our mouth like an arrow. We can’t stop the arrow from hitting its mark once it has left the bow. Same with our words, once they come out of our mouth we can’t stop them. When an arrow hits its mark it digs in deep, when untruthful words come out of our mouth they dig deep into the heart of the person who hears them. They will hurt their heart. We can’t take words back and pretend they have never been said – they have been and the hole in the heart is proof! The only way we can fix untruthfulness is to apologise and ask forgiveness. Once we have been forgiven we need to commit ourselves to truthfulness so trust can be built again. What is left now – all the nails are gone, Jesus has forgiven us for our lying, we have fixed relationships and our family and friends have forgiven us for lying but what do we have – we still have the holes. Those holes are the consequences of the nails – we’ve removed the nails but we can still see that they have been there. Same with our lies – we have removed the lies but we can still see that they have been there. If we turn the wooden block over though where there have been no nails, there are no holes either. This should be our life – no holes of lying – just a nice clean life of living in the truth! One of the indicators that we have done wrong things and haven’t fixed them is a guilty conscience. Our conscience is like a little robot that sits on our shoulder. He commends us when we have done right. We must listen to our conscience. Truth is truth – there is no such thing as a small lie, as a half-truth or a white-lie. Truth is a 100% word, you are either truthful or you are not. When truth is not the whole truth, it becomes a deceit, a lie. This is very important to understand. When we learn about truthfulness this doesn’t give us permission to blurt out anything that comes to our lips (often bypassing our mind). As a Christian our goal is to become more and more like Jesus. If he was grace and truth we need to be grace and truth. We can find ourselves in a tricky situation where the truth would appear to be hurtful. We must remember that Truthfulness is not in isolation, away from other character traits. What we need in these tricky situations is tactfulness. not to offend other people. When we live our life with character we will always be able to do the right thing and consider other people. Tactfulness needs three character traits working together. When we speak to someone it must always be with Love . Love is putting the needs of others first. We must remember how precious the other person is. We must speak what will bless them, not what will make us feel good. When we speak to someone it must always be with Compassion, which means we want to help and care for them. So in order to be Tactful we must remember all three traits; love, compassion and truthfulness. We don’t just have one; we have to have all three working together. We must neve want to hurt a person or make them feel bad or silly. We must stop and be careful to choose our words wisely. 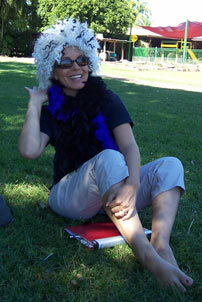 I dressed up in a wig and a feather boa – and walked in on the kids. They of course giggled and made comments. And that was fine – it gave me material to work with as I discussed tactfulness with them. I told them it was okay to laugh at me because they knew I wasn’t serious but if they could pretend that I was serious what would I feel like if they had laughed at me? We then discussed words that they could say if someone came up to them in a ugly outfit, in a wacky hat, with a horrible haircut etc. What could they say when someone gave them food that was disgusting or they simply didn’t like. With each of their answers we looked for love, compassion and truthfulness. I am sure each family has many situations they have come across where tactfulness was called for. Discuss these! Do you have any Questions or Comments on Truthfulness training?